A bathroom remodel not only increases your home’s resale value and piques the interest of potential buyers, but for the client, it can be an escape and an oasis to recenter themselves. Find a vast variety of bathroom sinks and faucets, showers, and tubs, vanities, and toilets online or in our ProSource® of Toledo showroom! 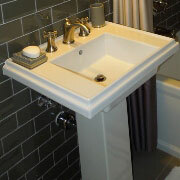 Don’t wash style down the drain by not updating your sink! A bathroom sink is a crucial component of the bathroom remodel, so grab your client and explore all of our sink options at our Toledo showroom. Let the water freely flow through a deck-mounted sink faucet you know your client will love! Make this piece even more customizable with the configuration, height, length, number of handles, and the style. Showers can be the place for creativity and coming up with the best ideas or it can be a refuge and a place for self-care. Spawn your client's best ideas or create a relaxing space with a shower remodel. 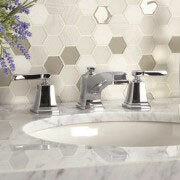 Embrace the wide variety of shower pieces and parts at ProSource of Toledo. Vanities provide excellent storage solutions for all of your client’s clutter, no matter how large or how small the bathroom is. 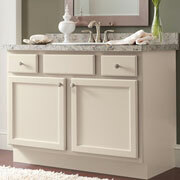 Consolidate the area with a customizable bathroom vanity today. 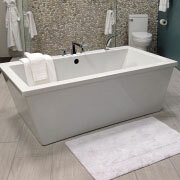 Does your client have young kids and doing a bathroom remodel specifically for a tub? Choose from a wide variety of kid-friendly tubs in different styles, colors, and price points. There is a whole market devoted to toilets of all flushing kinds — from one- and two- piece toilets to smart toilets that are hand-free. 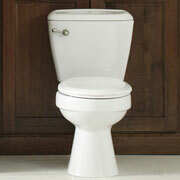 Peruse the toilet options with your client today and complement any new bathroom remodel with a new throne to sit upon!